This is the second installment of Jake’s CosRunning Series. You can check out his first feature on CosRunning. If you are looking for ways to add more character to your Casual Running adventures, consider running races in Costumes. Jake will be bringing you more great features with costuming ideas – including how he creates his awesome looks – that are both awesome looking and runner friendly. 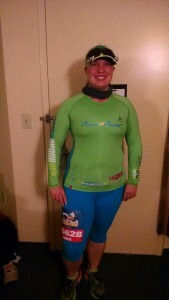 Jennifer in her specially-designed race day costume. A lot of Casual Runners like to stick with the familiar running gear that works for them, but for some of us, dressing up as a favorite character is just too much fun to resist. In this CosRunning series, I will run you through the creative process of a few of my favorite race costumes. I will do my best to give a comprehensive look at costumes ranging from very easy to pretty complex, give some insight into how the whole creative process works, and share some tips you might be able to use for your own costumes. Also, you can always check out our Race Costume Gallery, which will be updating throughout the race season. In this installment, I tear up the track as a Pixar favorite and share some costume tips of a graphic nature. When we set out on our runDisney adventure, Jennifer and I wanted to stick with costumes inspired by the theme of each race weekend throughout the year. For the runDisney Walt Disney World Marathon Marathon Weekend, there really was not a theme. 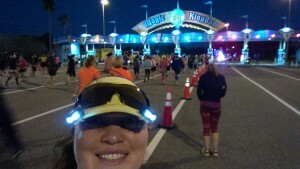 Sure, each of the four races has its own associated character (Pluto’s 5K, Minnie’s 10K, Donald Duck’s Half Marathon, and Mickey Mouse’s Full Marathon, Goofy’s Half/Full Challenge, and Dopey’s 5K/10K/Half/Full Challenge), but without a specific theme, we were left to our own devices. We focused our brainstorming on characters who did not have their own themed race weekend, but are beloved Disney (or Disney property) characters and maybe should have their own race-themed weekend (a whole section of Disney’s California Adventure is dedicated to Cars with painstaking detail taken to exactly replicate Radiator Springs, why not have a runDisney weekend dedicated to these racers?… someone should get on that. KA-CHOW!). 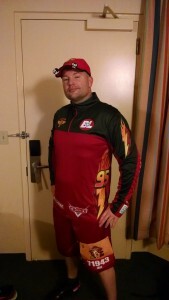 Jake sporting the finished costume concept, Kachow! My choice for Lightning McQueen was pretty easy, but Jennifer was a little more conflicted. Sally is Lightning’s girlfriend (and while we do not always choose our costumes to be a couple, it is something we think about for our concept), but she is not a racer and does not have any cool graphics. So, we looked to Cars2 for inspiration. Specifically, the only female race car in the World Grand Prix… a hot little Brazilian number (numero oito) named Carla Veloso. Having lived in Tampa for three years, I know how temperamental the weather in Orlando can be in January. So, planning a costume around temperatures that could range from the mid-thirties to the mid-seventies can be a challenge. I decided to use a loose, long sleeve, lightweight shirt, baggy shorts, and a running hat as the primary costume elements. This would allow me to layer underneath if need be. With the base of the costume identified, I got busy on the hard work for this costume: the graphics. I knew recreating all the graphics for Lightning was going to be a lot of work, but I also knew it would be the graphics that made the costume. I set out to replicate, as closely as possible, Lightning’s World Grand Prix graphic layout. Of course, cars and people aren’t exactly built the same, so I had to get a little creative. The bill of my hat became the hood of the car, my shoes became the tires, the graphics on Lightning’s rear end went on my… well, you get the idea. I grabbed a pencil and paper and started to sketch out where the graphics would fit best and make the most sense. Once I had a final sketch, I decided there was extra room to add logos from other fictional companies in the Pixar movies: Pizza Planet from Toy Story, Sea Meister from Finding Nemo, and Buy N Large from Wall-E were added to my list of corporate sponsors. After that, all I had left to do was crack open my laptop and start drawing. Or so I thought. The graphic design portion of the project. Sometimes a simple shopping trip at the local running store can be a great source of inspiration. We were picking up packets for a local race and stopped to take a look at race gear. Jennifer found some clip-on headlamps and suggested they would make a good headlights… further confirmation that I married the right person. Another trip to another running store (I’m telling you, they are fertile ground for creativity) we came across spur lights for the back of your shoes, but all we saw were tail lights. They only had the yellow ones at the store, but the packaging suggested they made red ones, too. After a simple search online and a few clicks, our tail lights were on their way. Once I completed work on the graphics, I did some test printing to get the colors right. 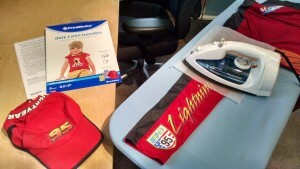 Since I was ironing the graphics onto a red shirt, I used a red background behind them to make cutting easier. Leaving a thin red edge around the iron-ons would help me avoid having to make clean cuts right against the edges of each graphic (basically, it gave me some wiggle room). I also printed out each of the graphics onto regular paper to test for proper size on the shirt and hat. When I had the colors and sizes right, I printed the graphics onto iron-on transfer sheets. Even with some wiggle room, one of the most critical (and tedious) parts of the whole process was cutting. Depending on the cut needed, I used a combination of scissors and an x-acto knife. For curved edges, the scissors worked best, and for straight edges, a metal ruler and blade were the right tools for the job. A look at the costume assembly. As for ironing, it is almost as much an art form as drawing the graphics…getting the heat just right and knowing how long to leave it on a transfer sheet takes some trial and error. I practiced on a test piece of a similar material before starting on the costume and made sure I had extra transfer sheets on hand in case I needed to reprint anything. This turned out to be a good idea because a couple of my graphics got a little too hot and it darkened them. I ironed the reprinted graphics over the top of the darkened ones, and no one could tell the difference. 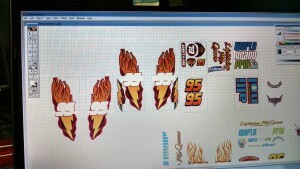 Other than taking a black Sharpie to my shoes, graphics were the only alterations I made to the race gear. The rest was just a matter of keeping an eye on the weather and packing strategically. The weather forecast had predicted colder temperatures for the race, so I was glad I planned ahead from the beginning to leave room for layers. A long sleeve ColdGear compression shirt and gloves were added to the costume that morning. This was also the first time I used a large trash bag as a warm up before the race. I was so impressed by how well it blocked the wind (on top of how cheap and easy to dispose it was), that I have used trash bags as warm ups for several races since. The working “headlights” incorporated into the costumes for extra effect. We all have our own motivations for running, but most of us do it because it is fun, and running in costume only adds to the fun. Coming up with a costume idea and putting it all together is a fun project in itself, but it also increases the excitement leading up to race day. And since you have to register for a race months ahead of time, working on a costume can help fill a few of those hours when you’re not out on a training run. Hopefully, this article has given you some ideas for your next CosRunning adventure. You did a great job! You are totally right that the Cars characters are super overlooked as race/costume ideas.